It does so much right, and yet it's not a slam dunk. There's a certain magic in the air ahead of a console launch. Unlike with phones and other gadgets, we don't see new game systems very often, so each new release feels momentous. That's particularly true for Nintendo, a company that's been striving to differentiate itself from its rivals. While Sony and Microsoft are pushing their consoles to be more like gaming PCs, Nintendo has focused on creating unique experiences that you can get only by buying one of its systems. The Switch has a lot riding on it. Nintendo has to make up for the missteps it made with the Wii U, and it has to convince gamers that a portable system can also be a decent home console. And of course, the company is under pressure from Sony's PlayStation 4 Pro and Microsoft's upcoming Scorpio. But while those systems are focused on offering powerful specs for 4K gaming and VR, Nintendo is once again selling something completely different. 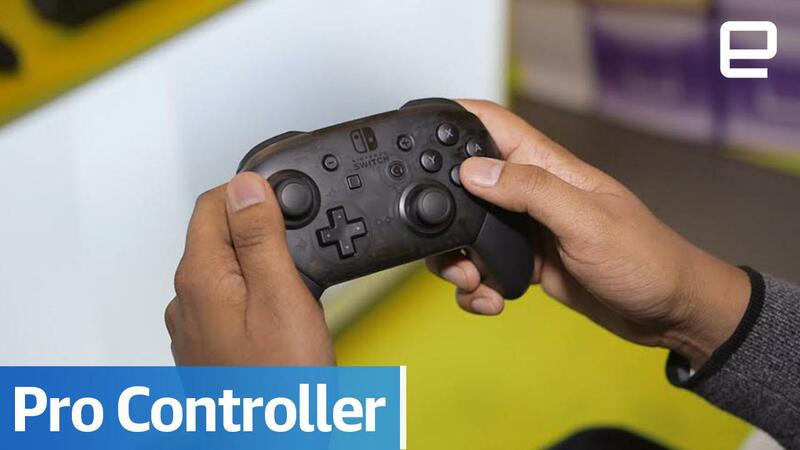 Nintendo's Switch Pro controller is a solid alternative for gamers looking for a more traditional gamepad, but at $70 it's surprisingly pricey. Be the first to review the Switch Pro Controller? How would you rate the Switch console? No doubt about it, the Switch is unlike any system we've seen before. It's both a powerful portable device and a capable home console when connected to your TV. The ability to easily swap between different modes just by dropping the system into its dock is what makes it truly special. Nintendo doubled down on the Wii U's best feature: being able to play games entirely away from your TV. But unlike that console, which relied on a clunky Fisher Price–esque gamepad, the Switch is a lot more refined. And, thankfully, you don't need to worry about staying within wireless range of it either. At its core, the Switch is basically just a very powerful tablet. It's driven by a custom version of NVIDIA's Tegra X1 chip, which also sits at the heart of that company's Shield set-top box. 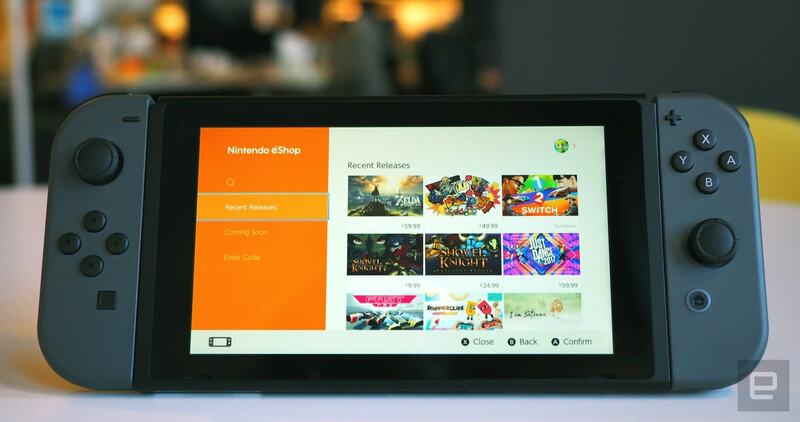 In fact, Nintendo's system is also reminiscent of NVIDIA's Shield tablet, an earlier stab at combining portable and home gaming. The Switch is much beefier than a typical slate, though, measuring around 15.2 millimeters thick. It also features a 6.2-inch 720p display -- a huge improvement over the Wii U's low-resolution screen. And even though it's made entirely out of plastic, it feels sturdy enough to survive a few drops. Aside from the usual power button, volume controls and headphone jack on the top of the tablet, the Switch also has a USB-C port on the bottom for charging. It's definitely nice to see Nintendo finally give up on proprietary charging cables. There's also a slot for game cards on top, a kickstand around back, and a microSD card slot nestled underneath the kickstand. The console ships with 32GB of internal storage, but it's helpful to be able to upgrade that easily. Yes, Nintendo decided to forgo optical media with the Switch. The game cards it relies on look similar to the cartridges used on the Nintendo 3DS and DS. While it seems like a throwback, using game cards makes a lot of sense today. They don't skip like optical media (which is important for a portable device), they load data faster than discs, and they can also store a lot more than they used to. It wouldn't be a new Nintendo console without unique gamepads, and the Switch's Joy-Con controllers certainly fit the bill. They resemble two miniaturized gamepads; both feature an analog stick, four face buttons, two top buttons and another two buttons on the sides. There are a few differences, though. The left Joy-Con has a minus button and one for taking screenshots. The right Joy-Con, meanwhile, has a plus button and another one for quickly returning to the home screen. Sliding on the included Joy-Con Strap accessories makes their buttons easier to hit, and gives you some helpful ways to secure the controllers when you're playing a game that uses motion controllers. 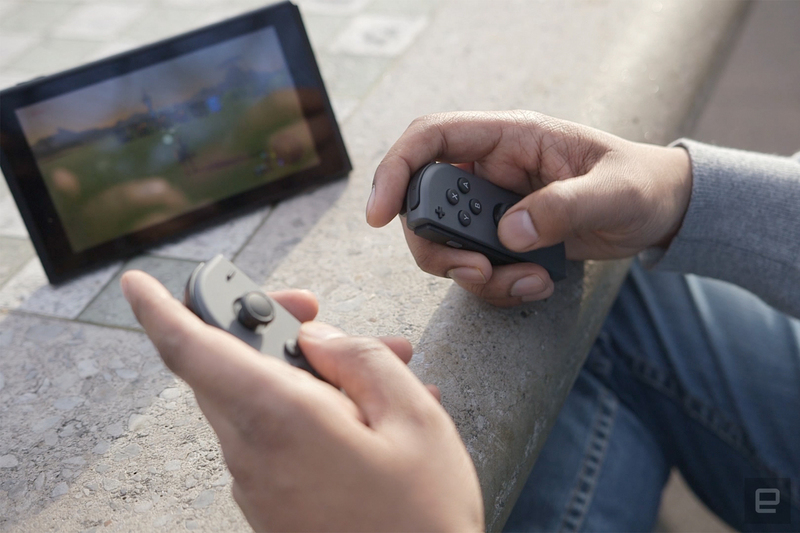 And, as you've probably seen from Nintendo's Switch promotional videos, you can also hold the Joy-Con controllers horizontally to use them as tiny gamepads. While it's not exactly an ideal way to play modern games, it lets you bring in a friend for head-to-head battles in titles like Mario Kart 8 Deluxe. In many ways, the Switch is defined by how you're using the Joy-Con gamepads with the tablet. Slide them onto the side of the Switch and you've got a game system you can take anywhere. You can also pop out the kickstand, place the Switch on a table, and hold the controllers in each hand. But once you dock the tablet and slide the controllers onto the included Joy-Con Grip accessory, you're dealing with something that's more like a traditional console. The system's dock is mostly just a slab of plastic for charging the Switch. 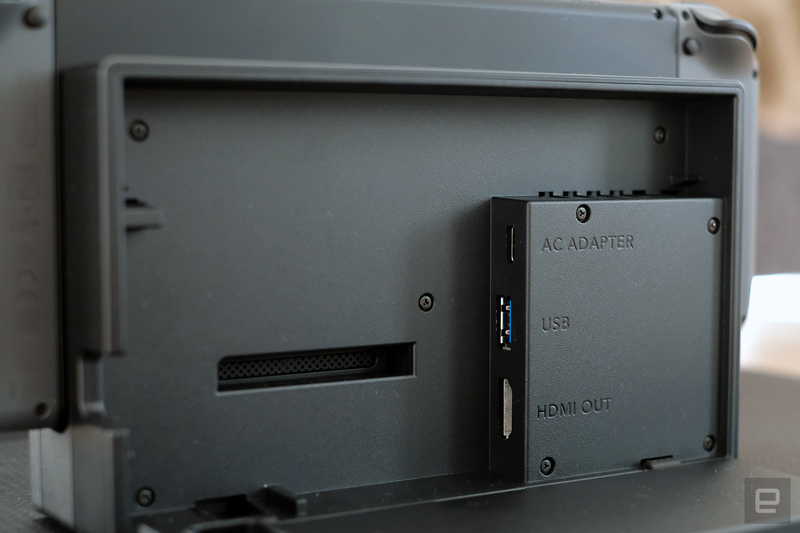 It has power, HDMI and USB 3.0 connections on the back, and there's a useful flap for routing your cables neatly. There are also two additional USB ports on the side, which could be useful for charging controllers and low-bandwidth peripherals. While it's fairly plain-looking on its own, the dock looks attractive when the Switch is in place. And, thankfully, Nintendo made it easy to drop the console into the dock. I never had an issue with the Switch getting misaligned, and I'd imagine it wouldn't be a problem for kids either. While it might look hefty, the Switch is actually lightweight and easy to hold with two hands. It's definitely a bit awkward to hold one-handed with the Joy-Con controllers attached, but that's not something you'll be doing much. Most important, it feels light-years beyond the Wii U's clunky gamepad, which in retrospect was little more than a prototype for the Switch. Whenever I handed the console over to someone, they immediately remarked on how light and balanced it felt. The Switch's screen is bold and sharp -- for the most part. It worked best indoors and on cloudy days. But once there was a hint of sun in the sky, it was a lot harder to see anything on the screen. And yes, I made sure to turn off automatic screen adjustments and crank the brightness all the way up. Even when the screen was bright enough, its high reflectivity often got in the way. Compared with the displays we're seeing on modern phones and tablets today, the Switch is noticeably inferior. While it's easy to hold, the Switch isn't exactly pocket friendly. It'll stick out of most pants and jacket pockets, thanks to its extra-wide frame. This is definitely the sort of gadget that you'll need a bag to transport. I'd also recommend snapping up a case to protect the screen. I tested The Legend of Zelda: Breath of the Wild for most of this review, and at the last minute I received Super Bomberman R. Zelda performed well; it's certainly a lot smoother than other games I've seen running on NVIDIA's X1-powered hardware. In particular, Zelda's stylized graphics also do a fine job of showing off the Switch's screen indoors. Super Bomberman R, meanwhile, is ... Bomberman. It's not that different from other games in the series, and it doesn't do much to show off the Switch's capabilities. I had no trouble playing Zelda for hours on end in the Switch's portable mode. The Joy-Con controllers are well suited to mobile play, since they're not very large. All of the controller's buttons offer a decent amount of feedback, though you can only expect so much from small buttons. 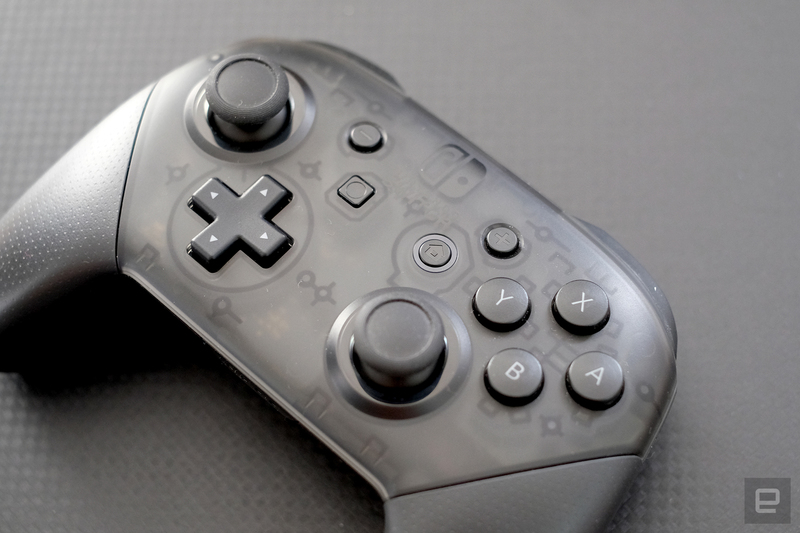 Sure, I miss having a traditional directional pad on the left side of the console, but I'll gladly forgo that for the ability to turn the Joy-Cons into two tiny gamepads. The latter feature isn't very helpful in Zelda, but it will be in future games like 1-2 Switch and Snipperclips. As you'd expect, battery life is the Switch's biggest portable problem. I was able to play Zelda for only around two and a half hours before I needed to recharge. 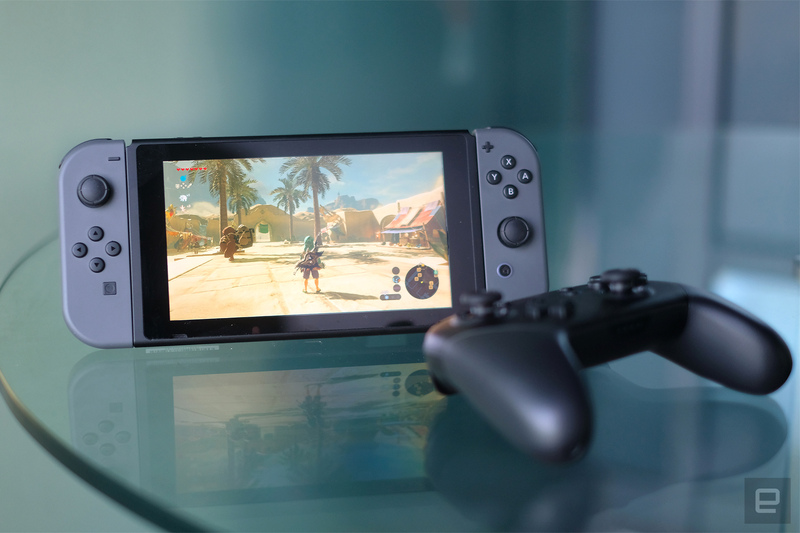 Nintendo claims less demanding games might last for up to six hours, but I'll take that figure with a grain of salt, since the company previously said Zelda would get around three hours of battery life. Clearly, it's not the sort of device you'd want to take on a long trip without a power adapter or backup battery. Since it charges via a USB-C port, though, you should be able to juice up easily with typical battery packs in sleep mode. (Hooray for interoperable standards!) You might have trouble charging from some sources while playing Zelda, since the system would technically be using more power than it takes in. It was a unique experience playing Zelda in the Switch's tabletop mode (with the kickstand out), though it's clearly not an ideal way to play the game. It's far more immersive when you're actually holding the Switch in your hands. That kickstand, by the way, is easily the flimsiest component of the entire system. It's just a thin piece of plastic, and I often felt like I'd rip it out of the system whenever I used it. At least Nintendo recognizes it could be a problem: The company points out that you can simply pop it back in the Switch if it falls out. Still, that's a component that might not last too long in the hands of unruly kids. The Switch feels much more familiar when it's docked to a TV. As soon as you slip the Joy-Cons into the Grip accessory, there really isn't a huge difference between the Switch and Nintendo's previous consoles. As a former Gamecube owner, I also felt a bit of nostalgia holding the Joy-Con Grip. It's similar to Nintendo's excellent Wavebird controller in your hands, even if the two gamepads don't look much alike. Naturally, Breath of the Wild is a much more epic experience on a large television. The game simply looks great, with long draw distances, spectacular lighting effects and detailed characters. I lost count of the number of times I set the controller down just to take in Zelda's detailed environments. In particular, I loved the way sunlight and clouds slowly rolled over the game's expansive environments. Zelda had some performance issues when the screen was filled with enemies and lots of action, but it wasn't anything game-stopping. It's not really news that the Switch's graphical capabilities aren't competitive against the PlayStation 4 or Xbox One -- that's not the market Nintendo is aiming for. The Joy-Con Grip held up through hours of playtime, though the smaller buttons on the controllers were irritating during longer play sessions. And, strangely enough, you can't charge the Joy-Cons from the Grip; you have to reconnect them to the docked Switch to do so. If you want to refuel while playing a game, you'll have to shell out another $30 for the Charge Grip accessory, which includes a USB-C port on the top of the gamepad. While the Joy-Cons should technically last for round 20 hours of playtime (I never noticed them losing much charge), it's still baffling that Nintendo is making you pay extra for the privilege of a USB-C port. And despite its name, the Grip Charge doesn't have any sort of built-in battery to recharge the Joy-Cons either. Nintendo's Switch Pro controller is a solid alternative for gamers looking for a more traditional gamepad, but at $70 it's surprisingly pricey. It's the only Switch controller with a directional pad, which makes it a must-have if you're into fighting games. It wasn't long before I started favoring the Pro controller while playing Zelda, though I noticed some build-quality issues after a few hours. The controller's right analog stick stopped rotating smoothly and feels a bit rough in certain spots now. That's the sort of thing that a warranty would cover, but hopefully it's not a widespread problem. One surprising issue: There's currently no way to get wireless audio from the Switch when it's docked. That's practically a standard feature in consoles today -- even the Wii U! -- and its absence could pose a problem for anyone who wants to game at night without disturbing their housemates. 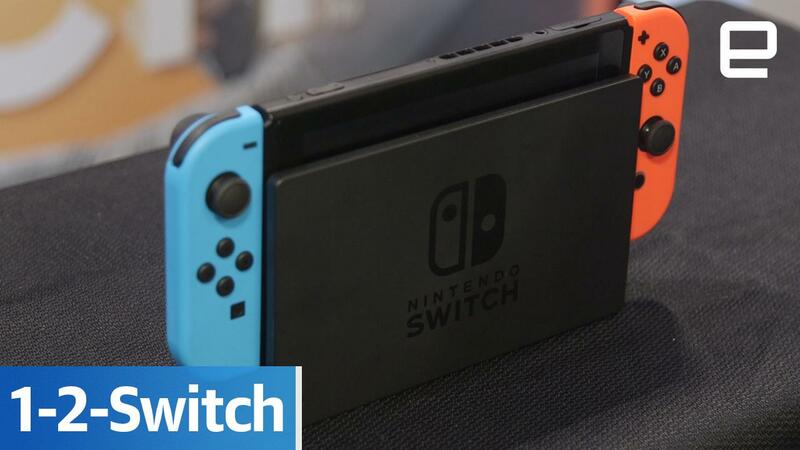 There's a chance that you'll be able to get wireless audio from the upcoming Switch mobile app, but Nintendo hasn't commented on that yet. The Switch's day-one update adds a slew of new features that I couldn't test in my initial review. Most importantly, it gives you access to the Switch's eShop, where you can actually download new games. If you've used Nintendo's online stores on the 3DS, Wii U or Wii, you won't notice any significant changes. It shows off recently added games (only nine are available at the moment), and it lets you keep an eye on upcoming titles. And yes, if you have money sitting on a Wii U or 3DS online account, you'll be able to transfer it to the Switch eShop when you first sign in. Similarly, the Switch's friend list looks very familiar -- right down to the resurrection of the dreaded friend code. Luckily, that's not the only way to add multiplayer buddies: You can also choose from people near your Switch, or folks you've played online. There's not much you can do with the friend list right now, but it will be the central piece of Nintendo's upcoming mobile app, which lets you chat with your buddies. As much as I loved the Switch's ability to let me game just about anywhere, there's still a lot that's up in the air. Nintendo's multiplayer network is free for Switch owners until the fall, for example, but we don't know how much it'll cost after that. At this point, all we've learned is that it will rely on a smartphone app and could potentially cost between $20 and $30 a year. You'll also have to wait until who knows when to play Virtual Console titles on the Switch. Additionally, I didn't have a chance to review the Switch's newer gaming experiences ahead of its launch, like the unique 1-2 Switch minigame collection . I've enjoyed what I've played of that game from preview events, but it would have been nice to actually test it at home. Nintendo's slim launch lineup doesn't inspire much hope either. Aside from Zelda, there aren't any must-have titles, though I'm looking forward to getting my hands on Arms, Mario Kart 8 Deluxe, and Splatoon 2 later this year. Clearly, Nintendo was in a bit of a rush to launch the Switch. That's a shame, because it's tough, as a reviewer, to completely weigh in on a system that's not quite finished. It's also particularly worrying after the failure of the Wii U, a console that launched with a series of baffling issues as well. If Nintendo wants to make shoppers more confident about its abilities to launch new hardware and networking capabilities, this isn't a good start. We'll update this review once we get a chance to test more games and features. While the Switch technically competes with all of the other consoles on the market, it's clear that Nintendo isn't trying to take them on head-on. Instead, like with the Wii, it's offering an alternative experience. Sure, you can get luscious 4K graphics on other consoles, but when did you last go head-to-head with a friend in Mario Kart? Still, the Switch is $300, so if you have a limited budget for gaming, you might be better off with the PlayStation 4 Slim or Xbox One S. Those consoles cost the same but have far more robust libraries and multiplayer networking features. And while Nintendo claims the Switch doesn't mean it's giving up on the 3DS, it's not hard to imagine that having a more powerful portable console on the market could eat into that system's sales. My big takeaway from the Switch: Nintendo has figured out how to innovate once again. It's clearly different from other consoles, and it does plenty of new things that gamers might appreciate. But the system's battery life, outdoor screen performance and unknown networking capabilities have me worried. Nintendo has wowed us again, but it still has a long way to go to prove that the Switch isn't another Wii U.
Aaron Souppouris contributed to this review. Update 3/6: Added more details about the Switch's friends and eShop feature.